After a fine wine and music trip to Ontario we have been anxious to get on our way again before the summer vacation masses hit the road. We had several appointments to take care of including one to finally put the summer tires on the Prius. We also managed to continue some of the work on the garage the got put on hold when it got too cold there to plaster and paint (at least that was my excuse). The general objective for this trip was to seek out some salt water and fresh seafood. Our thought was to again visit Bas St Laurent and Gaspé which we finally visited for the first time last year. We enjoyed it so much we will take time for a slower pass since we are not trying to hit all 10 provinces this year. We also hope to spend a bit more time in New Brunswick since we have been sailing through in pretty short order in recent years. We will also likely hit a bit of Nova Scotia but, since we expect to be back for Celtic Colours International Festival again in October, we will be a bit selective. We are considering trying to catch the The Royal Nova Scotia International Tattoo in Halifax toward the end of the month. It has been many years since we last saw it. It was a slow start for a variety of reasons but we finally pulled out of the driveway about 10:30. The first thing we did was head off the wrong way to stop by St-Viateur Bagel & Café DDO to pick up some fresh from the oven bagels to go with the fine smoked salmon we expect to find. 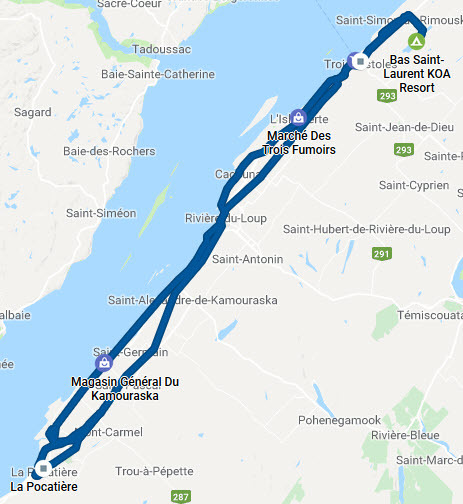 We then headed off across the Mercier Bridge, picked up A30 to A20 and on to the east. It was a largely uneventful drive. Weather was mostly overcast which was easy on the eyes. We hit the off rain squall but not much to speak of. We arrived at Bas Saint-Laurent KOA about 5:20 PM and checked in for 2 days (weekend minimum which suited our plans). In spit of the camp being pretty full with a group in for the weekend, we ended up in a spot almost the same as last August. We had a light dinner the to a quiet evening. I actually got this started day 1 for a change. It is great to be on the road again. Today we decided to backtrack to La Pocatière and start our way along the Bas Saint Laurent segement of the Route des Navigateurs. 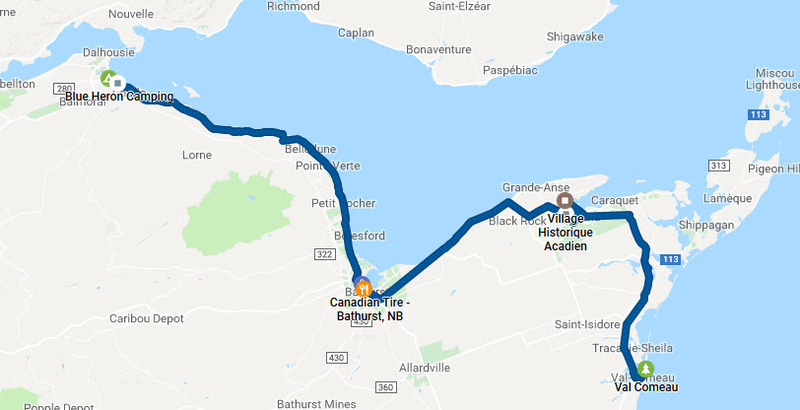 Working our way back to camp should give a good day's touring and we can continue on tomorrow as we make our way out to Gaspé. We set out about 9:45 AM after a nice breakfast from the galley. We worked our way fairly directly to La Pocatière where our first stop was Fromagerie Le Mouton Blanc where picked up some nice sheep milk cheese as well as some 3-year Cheddar and some frozen lamb sausages. While in La Pocatière we also stopped at Boucherie Rossignol where we picked up a couple of things to nibble on. For the next while we just took a quiet roll along the road. We eventually stopped at Magasin général du Kamouraska which Lillian checked out while Rod took Weston for a but of a stretch. It seems to have been somewhat disappointing - "They took their Saturday Garage Sale inside". Just down the street we popped into Chocolaterie La Fée Gourmande where Lillian picked up some tidbits. She made special note of an espresso on ice cream that elegantly filled her desire for a Latte. We got back on the road for another hour of touring before we stopped at Marché des 3 fumoirs in L'Isle-Verte. We had been discussing some ideas for supper and this solved it nicely. We walked off with container of lobster meat from one cooked bug and some other goodies including some shrimp and cold smoked salmon. In Trois Pistoles we stopped at the IGA for some basic supplies, gassed up then headed back to camp. As we passed through St. Simon we popped into Saint-Simon Bagel to resupply since half our Montreal bagels had disappeared. We got back to Bas Saint-Laurent KOA about 4 PM and relaxed for a while before making up some lobster rolls for dinner. We sat around a camp fire for a while before Lillian crashed and I wrote this lot. The day dawned sunny but with the temperature in the single digits. Brrrr! We started with smoked salmon purchased yesterday on begals with cream cheese. Yum! Since it is Sunday and not raining, it was time to groom the beardie. As usual, a great, hairy dog on a picnic table started some conversations. Once the boy was all spiffed up, we got on out way about 10:45. Yesterday we had been in touch with some friends (M&L) that live in the area. It seems that they were in Quebec City for the weekend at some Dog Agility Trials and would not be home until this evening. 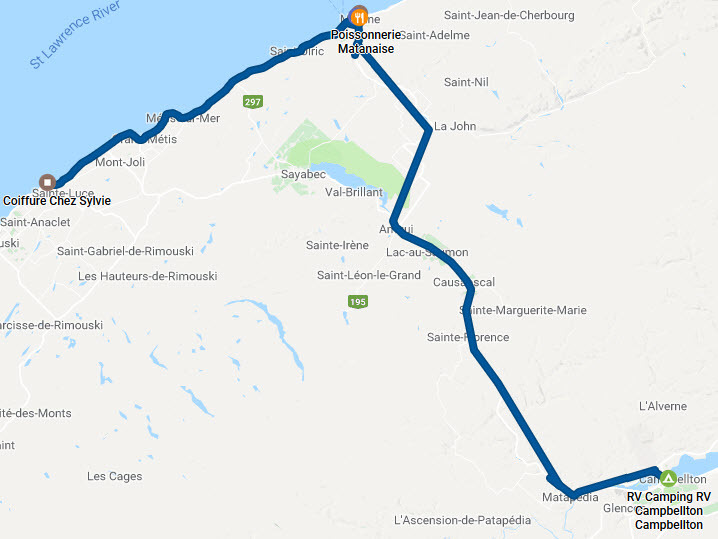 We decided we would continue our roll along Route des Navigateurs at least until the Mont Joli area where we would see if there was enough to do and a place to stay near M&L. Our first stop was at Le Site historique maritime de la Pointe-au-Père. 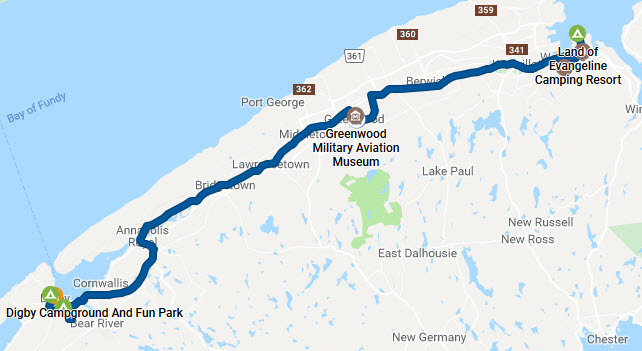 This included 3 exhibits: The Lighthouse Station (Canada’s second-highest lighthouse), The Onondaga submarine and The Empress of Ireland museum. Entry to the Empress exhibit was free today so we enjoyed learning about RMS Empress of Ireland, an ocean liner that sank near the mouth of the Saint Lawrence River following a collision in thick fog with the Norwegian collier SS Storstad in the early hours of 29 May 1914. We took some pictures of the lighthouse and submarine the got on our way before Lillian froze in the chilly breeze. We made our way along to Halte (rest area) Flavie-Drapeau near Mont Joli after checking our some area camp sites. 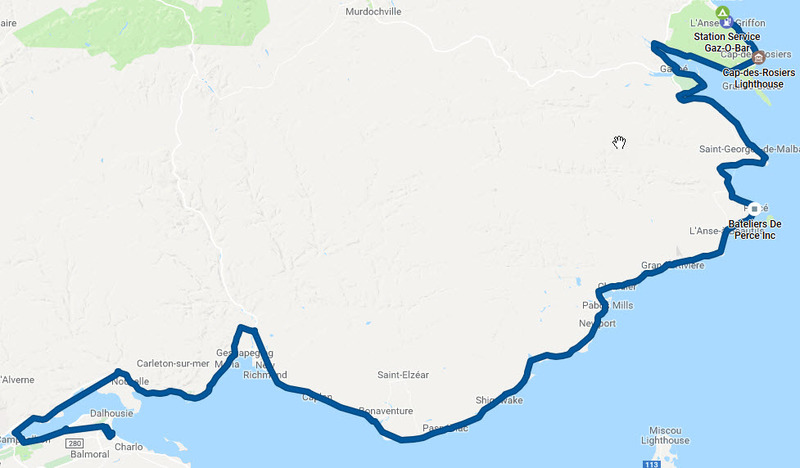 We made some lunch and checked out some other possibilities in the area and decided to move on toward Gaspé. So we resumed our wander along the Route des Navigateurs. As we passed through Matane we made a stop at Poissonnerie Matanaise, a fish shop we stopped at last year. We picked up some smoked salmon to replace that consumed at breakfast and a couple of other items. Before moving on we figured we ought to plan where to camp. Our original plan had been to move right on to the Gaspé area but we were running a bit late. We put in a call to Camping Griffon where we stayed last September. They had room and no problem with us arriving a bit late so we hit the road again. It was a perfect day for this very scenic drive. We took a couple of stretch and picture breaks along the way but otherwise made steady progress. We arrived at camp just short of 7 PM. After setting up we made a pasta sauce with the shrimp we picked up yesterday and applied it to some angel-hair pasta for a late but super supper. After eating we had a chat with a nice couple from California who were touring with their four children. We shared a bunch of information about their upcoming itinerary and they promised to let us know how they made out. Today we set off to explore Gaspé. We set off about 10:00 after dumping "the ugly tanks" and filling the gas tank. We took a loop around Forillon National Park. Checking ahead in the guide we realized that most information centers and other manned sites were not opening for the season for a week or two and we were not interested in much hiking around because it was pretty chilly out - especially near the water. We did revisit Cap-des-Rosiers Lighthouse which, at 34 metre high stone light-tower, perched atop rugged cliffs, is the tallest lighthouse in Canada. It really is impressive. 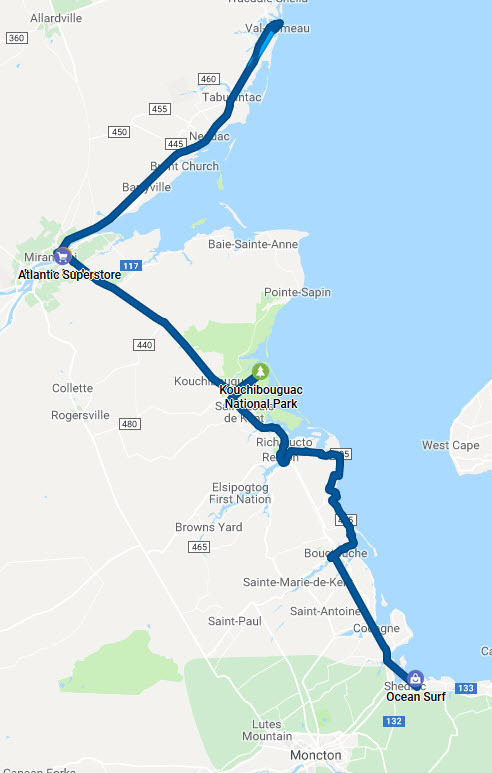 From there we basically followed the 132 through the various "sub-towns" of the post-merger city of Gaspé including the main town. Since we did not need to do much "city shopping" we just rolled along and enjoyed the scenery until we arrived at Percé. Since it was lunch time we stopped at Le Comptoir de Monsieur Émile and found it was closed today. Besides being a great place for a tasty lunch, you can also buy their famous smoked salmon. Fortunately we can get the latter in Montreal. We moved on further into town and found a place to park. We were pleased to find that this was easy and free since when we were here last September the town was crawling with tourists and parking anywhere in the core of the town was $9 the day. Mind you, the weather was chilly and breezy even if reasonably sunny. The boys did some walking about while Lillian checked some of the shops she was unable to see last year. It seems we did not miss much since the shops were mostly repetitious tourist fare. At our stage we need more uncollectables than collectables. After a quick lunch at Mille Délices we rolled out of town again. Most of the next stretch of the 132 is less interesting than the St. Lawrence side but we hoped to spot a place to set up camp for the night. Most were uninteresting or closed so we kept rolling. When taking a rest stop we decided to boot for Camping Heron Bleu near Charlo, NB, a known good deal. We gave them a call and they had no problem with the late arrival. We arrived about 7:30 PM ADT and checked in. We got a nice, level, spacious site handy to the showers etc. We made a simple dinner and got an early night. Today we decide to take a break and catch up some chores around the RV and do some planning. It was a cool, overcast day well suited for indoor activities. We had plenty of great food aboard so we ate well and got a bunch of stuff done. We thoroughly enjoyed the break and we are looking forward to exploring the Acadian Shore tomorrow. After a nice breakfast we set out about 10:30 along the coast of the Bay des Chaleurs enjoying the scenery and the nice morning. We eventually rolled into Bathurst and pulled into the local Canadian Tire who sold propane. We pulled up to the tower and pushed the button which we know worked because we could hear the buzzer sound in the service area. After 20 minutes of Lillian checking in and our someone came over and told us that they do not fill onboard RV tanks. We suspect he did not want to crawl around and fill our tank since most Canadian Tire Gas+ with the tower DO fill RV's. We moved on with a grumble and stopped at a little waterfront shopping area that also had a tourist information. Lillian addressed the former while Rod attended to the latter pinking up the latest NB guides and some regional stuff. The lady working at the center was delightful and helpful. Lillian returned with only a Latte. We next set the GPS to find the Village Historique Acadien. 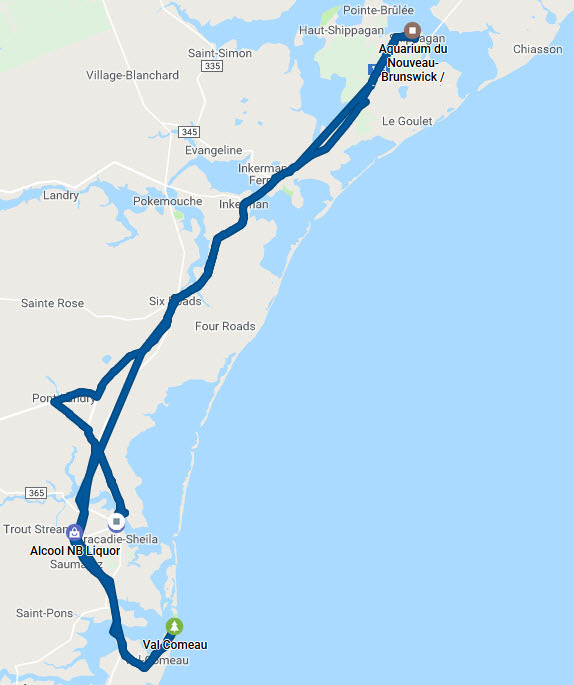 For some reason, as we got closer, it had us turn off route 11 and followed some lesser roads only to return us to route 11 further down. That would be annoying enough but along that winding path the pantry rolled open (the latch had slighly rotated and popped open) and a bottle of sesame oil popped out and the lid popped open spreading a generous amount of oil all over the floor and Weston's soft crate. Nothing broken but what a mess! We pulled over and wiped up as much of the oil as we could and fixed the latch and finally continued on to the Village Historique only to find that it opens June 10th. After some bad words we continued on our path. At this point we decided to move right along to our first choice for a camp for the night Camping Plage Val Comeau. It turned out to be more than acceptable. Not only did we get a nice river front site but there was an adjacent washroom and shower house with a big washup sink. We settled in and tackled the damage from the "oil spill". Lillian tackled the floor while Rod dragged the dog crate over to the sink and scrubbed the oil off the bottom of it. With all back in order, we opened a bottle of wine and relaxed. A lovely evening in a lovely spot. We created some dinner from a bunch of leftovers then relaxed to enjoy a beautiful sunset. Some annoyances but actually a pretty decent day overall. We started the day with another feed of bagels and lox (still working on the Matane lox) after which we slowly packed up and head out about 10:15. Our initial plan for the day was to backtrack to the New Brunswick Aquarium and Marine Centre in Shippagan. We arrived there shortly before 11:00 and paid our way in to the exibition. Just after we arrived it was time to feed the harbour seals they keep in a tank there (a female and 3 of her offspring). Much to the delight of a class of youngsters visiting, they put on a bit of a show. The picture for today show some of it. We then went back to touring the exhibit in order. Just as we finished the static exhibits where we learned a lot about the marine life of the region and the fishing industry we heard a call for the start of a film in the auditorium. We scooted over and enjoyed a good video on the evolution of the fishery on the Acadian shores and the fishery as it is today. We then resumed our viewing of all the aquarium tanks taking time to read the well done information cards. All in all and interesting and educational visit. They have done a good job. In the next building we found Restaurant du Pavillon Aquatique where we stopped for a really decent lunch. Over lunch we decided we would spend another night at Camping Plage Val Comeau since it was such a nice place. This would give us time to replenish the food and alcohol supply as well as seeking out a place to top up the propane tank. For the latter, we tried a couple of places as we worked our way back to camp. We were successful at the Canadian Tire Gas+ in Tracadie-Sheila. We then went on to the Atlantic Superstore for food. We also picked up a rotisserie chicken for supper. We then moved on to the NB Liquor store where we replenished our supply of "yeast-contaminated grape juice". Arriving back at Camping Plage Val Comeau about 4:50 PM we reclaimed our old site (actually one closer to the shower house) and picked up some firewood. We dined on the chicken, and enjoyed an evening by the fire. Sunset was less spectacular than yesterday due to overcast. Another good day overall. We seem to be learning to slow our pace. After the 10-province, one territory program of last year, we are learning to take our time. A pleasant but not terribly exciting day today. We set off about 10:20 after a decent breakfast. 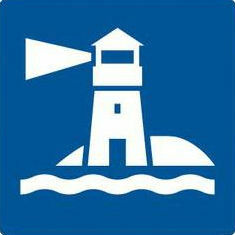 We primarily spent the day "following the " which are the symbol for the Acadian Coastal Drive. The scenery was pleasant but we did not encounter much worthy of exploration until we got to Miramichi where we took some time to explore around the "Historic Water Street" area and pop into a nearby Atlantic Super Store to pick up the cream cheese we forgot yesterday and a steak for dinner. We got back following the until we got to Kouchibouguac National Park where we dropped into the visitor center, chatted with the folks there for a bit and went through their exhibit. Since the time was working on and the "winged beasts" were thick, we got back on the drive. We eventually made our way to Town of Shediac where we set up camp at Ocean Surf RV Park-Camping. We go a spot handy to the laundromat so Lillian was able to catch up a bit on the laundry. We grilled the steak on our portable grill for a great dinner. Tomorrow we hope to move on to the Fundy Shore. We finally hit the road about 10:20 after finishing the last of our bagels and lox. Since we were in Shediac we figured we should visit The World's Largest Lobster at the other end of town. We took some pictures and Rod dropped into the visitor center while Lillian checked out some shops. After that we backtracked through town stopping at Adorable Chocolat which Lillian spotted on our "lobster hunt". She came out with a small chocolate cake/loaf and some maceroons which later proved to be quite superlative. From there we made our way on to Homarus Eco-Centre back near where we camped. The guided tour was most interesting and the lad giving the presentation quite interesting and well informed. After taking Weston for a nice walk around the rest of the area we got back to following the . This eventually brought us to Cape Tormentine about 1:40 PM where we found a "chip wagon" that just called out to us. We stoped for some "dogs and poutine" which were just excellent. The view, as we enjoyed our lunch, was the Confederation Bridge to PEI. After lunch we got back to following the . 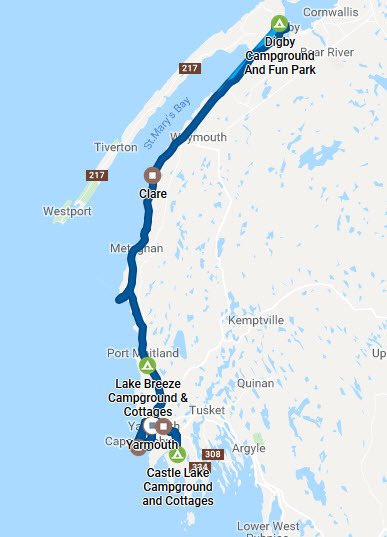 Once we got to Port Elgin we declared the Acadian Coastal Drive suitably completed and we set course for our planned camping at All Done RV Camping near Newtown. We checked in then headed over to Sussex to pick up some stuff for dinner at Sobeys. We returned to camp then wandered over to where their weekly "Washer Toss" tournament was under way. Lillian joined in the action while Rod chatted with some of the spectators. We eventually made some dinner and strategized over how to find a permanent problem in the Roadtrek where the wardrobe cupboard had the bottom falling out as a result of our carrying way more heavy stuff in there than it was designed to handle. In the interim it is patched up enough to carry on for now. 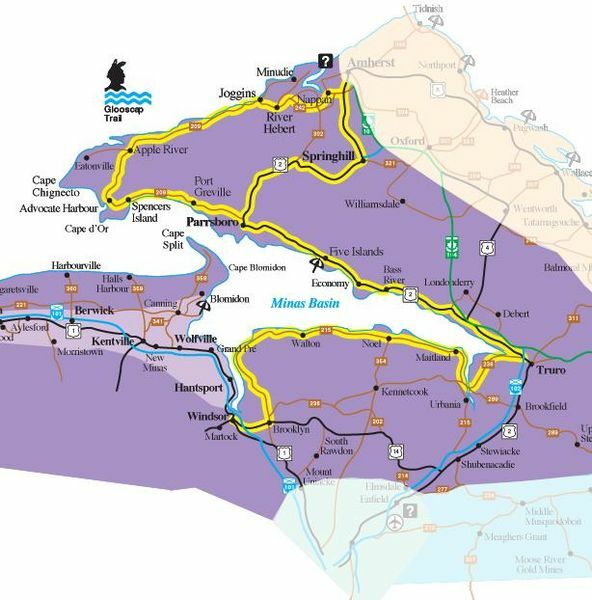 We hit the road about 8:45 to start on the Fundy Coastal Drive ( ). Since we did not eat before leaving, we stopped at Smitty's Family Restaurant in Sussex for a quick, inexpensive breakfast. After breakfast we backtracked along the to Fundy National Park where we checked out the gift shop at the visitor centre. We also checked out the Headquarters Camp Site where we booked a site for the night. We then moved on to The Hopewell Rocks at Hopewell Cape. We have wanted to visit this natural wonder for many years. We split a BLT at the High Tide Cafe before we took the shuttle down most of the way to sea floor walk. This still left us many stairs and a couple of KM walk on the beach. We took a bunch of pictures before climbing back up the stairs. It was getting pretty overcast so we decide to make out way back to camp. The town of Alma, which is next to the park, has a lot of restaurants so decided to eat out. We decided on the Tides Restaurant at The Parkland Village Inn which turned out to be an excellent choice. Lillian had a lobster roll with a spinach, feta and blueberry salad with a poppy seed dressing. Rod had sautéd scallops with sautédvegetables and fries. It also came with a sweet chili dip that worked very well with the perfectly cooked scallops. The veggies were also amazing and included some fresh fiddleheads that were really excellent. Not only was the food amazing, but we were seated by windows that had humming bird feeders just outside so we were entertained by the patrons of those treats. After dinner we headed back to camp and connected up the Roadtrek for the night. Since the evening was pleasant if a bit cool, we had a nice picnic table and there were 2 hours before sunset there was an opportunity to get Weston's Sunday grooming in which we did. A very busy but most delightful day! Today the plan was to continue on down the Fundy Coastal Drive ( ). We set out about 9:55 after a nice breakfast from the galley and backtracked our way to Sussex. As we came into town Lillian spotted Mrs. Dunster's Bakery Store which just had to be checked out. After about 15 minutes she came out with a selection of sweet and savory items for the galley. When we were last in town we found out about Legacy Lane Fiber Mill but it was closed on the weekend. Since this was Monday, we could and did check it out. Lillian actually came out emptyhanded. We next headed for what Google said was the closest Canadian Tire outlet. It turns out to be a defunct location so we headed over to the one we knew existed. While Rod popped in to the Canadian Tire to get a few items needed to patch up the problem cupboard, Lillian went into a nearby drug store. Back following the we made our way to the lovely town of St. Martins. As we pulled into town we spotted St Martins Ice Cream Parlor Fresh Lobster Rolls. Since it was already after 1 PM we pulled in to check it out. We ordered a lobster roll and an order of fried scallops which we split. Really quite decent. We then worked our way over to Century Farm Family Camp Ground which was just a short distance away and we set up camp about 2 PM. We spent most of the remainder of the afternoon patching up things in the Roadtrek - especially the previously mentioned cupboard. Eventually you will see a picture of the glued repair being "clamped" using the van jack and a couple of leveling blocks. We made a simple dinner and got an early night. Today we started around 9:50 after some breakfast and explored a bit around St. Martins. 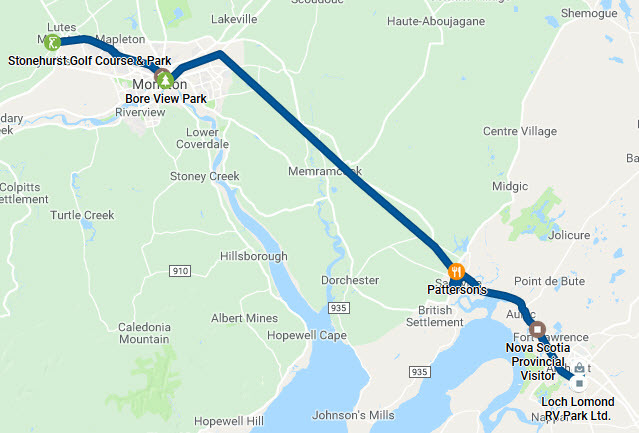 We resisted the temptation to check out Fundy Trail Parkway since it was a bit redundant and there seemed to be a lot of tour busses heading that way. We figured there be one or more cruise ships in St. John today. We picked up the trail towards St. John instead. When we arrived in town we took a loop down to the cruise terminal an confirmed that a large Royal Caribbean ship was in port for the day. We then headed over to the local Mr. Lube where we treated the Roadtrek to an oil change before it demanded it. It can be a challenge to get an oil change on van. First there is the size - you need at least 10' height - and then most places are reluctant or incapable of lifting it. Some of these oil change places use pits and have tall doors. 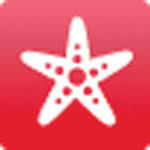 Given that, it is just an oil change on a Chrysler Pentastar 3.6 engine which are very common. Once that was done we went over to the McAllister Place Mall where we shopped around a bit then grabbed a bite at the food court. We then shifted over to East Point Shopping Centre where we popped into Sobeys and the NB Liquor Store. We finally found our way back to the trail towards St. Andrews By The Sea. On the way Lillian spotted a sign for Oven Head Salmon Smokers. After a few false starts we managed to locate it and purchase some of their product to go with the St-Viateur Bagels we found at Sobeys. We then carried on to St. Andrews By-The-Sea where we checked in to Kiwanis Oceanfront Camping where we stayed with friends last October. We headed over about 6 PM only to discover that they were fully booked inside and the deck, while available, was windy. We opted to take our choices to eat back at the camp which actually worked very well. Besides that we took a quiet evening. Rod took Weston for a good, windy wander around the camp and finally caught up this travelogue before forgetting all the good stuff. Today we left the camp at about 10:15 after a nice breakfast of bagels, cream cheese and smoked salmon. The latter, which we purchased yesterday, was very nice. Lovely Atlantic salmon perfectly smoked. As the first project we headed into town so Lillian could check out what had changed in the shops since last October. As is normal, "the boys" used the time to take a nice walk around town. It was a beautiful, warm morning. From there we set off for St. Stephen to visit The Chocolate Museum. It was very interesting. Of course mostly focused on the Ganong family, candy makers in St. Stephen since 1873. After that we wandered around St. Stephen for a bit finally setting off on NB route 3 in the direction of Fredericton. Along the way Lillian spotted a sign for Briggs & Little Woolen Mills. Needless to say we made a small side trip to check it out. A ball of wool and a couple of patterns later, we rejoined route 3. We set up camp at Great Bear Camping on the shores of the St. John river. We grilled that steak that was planned for yesterday before being blown off the menu. Super supper! Today was the first really rainy day of the trip. It had rained hard over night so there were puddles and mud everywhere in the morning. The rain had eased back but certainly had not stopped. Tried to hide under the covers but eventually crawled out. After some breakfast we set off about 10:15 and headed into downtown Fredericton to visit Science East Science Centre. The place was infested with several classes of budding scientists whose energy was boundless. The exhibits were quite well done learning experiences but aimed at a young audience. The centre is housed former jail built in 1842. There were should historical exhibits relating to that history which were quite interesting. During its last days as a jail it was used to house the infamous Allan Legere during his trial in the early 1990's. They even reopened the solitary cells in the basement for this special purpose. It was still raining so, after a drive around downtown Fredericton, we set course for Moncton along the Transcanada (NB route 2). We eventually ended up at Stonehurst Golf Course, Trailer Park & Driving Range in Berry Mills, NB around 3 PM. Since it was still raining we relaxed for a bit before making a good dinner from some leftovers. As I write this it is still raining though it should clear soon. We woke to much nice weather than we fell asleep to. It was cool but it was sunny and relatively calm. We had a bite of breakfast then headed off for Moncton. Our first stop was Resurgo Place "a state-of-the-art facility where Moncton heritage, technology and discovery intersect". We had an interesting visit again shared by a number of enthusiastic youngsters though a bit older and more manageable and managed. We had a good time exploring the exhibits then set off in time to arrive arrive at Bore View Park by about 11. The tidal bore was due at 11:38 but, like most things driven by "Mother Nature", the schedule may vary at whim. As the time approached we were given a talk on the nature and cause of this phenomenon. The actual bore was quite impressive. The power was illustrated by a couple of folks who surfed the bore as it came by. We now set out for Sackville and arrived a bit after 12:30. After a bit of exploration we ended up at Pattersons Family Restaurant where we both indulged in one of the daily specials, a seafood chowder. It was really excellent and generous. After that we went up the street to the Sackville Waterfowl Park. We had a nice hike covering about half of their viewing paths. A lovely day for a nice walk. We then set course for Nova Scotia arriving at the border visitor center about 2:50 PM where we picked up the latest maps and information. We made camp at Lock Lomond RV Park Ltd. near Amhearst. We then took a quick run into town for supplies settling back at camp about 5:30 PM. We found our 3 closest neighbours were folks from NB visiting for the weekend. After dinner we had a great chat somewhat interupted by visits to the handy laundramat where Lillian was getting caught up. Today we wanted to visit some old haunts along the Northumberland Shore. 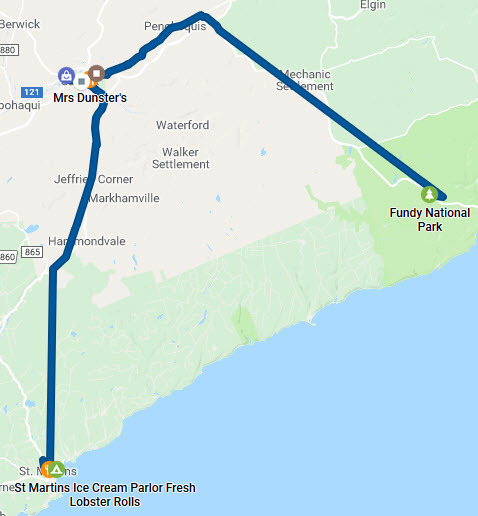 We hit the road about 10:00 and made for Tatamagouche remembering that the had a farmer's market Saturday mornings at Creamery Square so we wanted to get there in time. We arrived about 11:25 and set about exploring. We were astonished how much work had been done fixing up the buildings around the square. The actual old creamery building was now a museum and the market moved to a different building. There were a number of interesting vendors but few selling produce and meats as in the past. We had a good look around and bought some spinach from one of the rare produce vendors. On the way to the market Lillian spotted Yarn And Company at the top of the street so, of course, we stopped by. Lillian came out some 30 minutes later with wool and patterns much pleased with the discovery of a new wool shop with some decent product. We next stopped in to the NSLC to grab a couple of replacement bottles. As we were leaving we noticed some young folks selling hot dogs and hamburgers outside the adjacent Foodland store to raise money for some cause. This was a perfect lunch snack since we still had places to go. 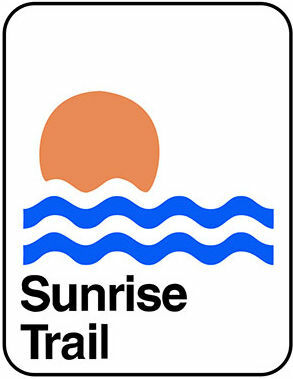 We next followed the Sunrise Trail on to Pictou. We stopped in at Water Street Studio Cooperative where Lillian poked around while "the boys" went walking. She also dropped in to Grohmann Knives which was next door and picked up a couple of small items. Rod snuck in briefly to see if they had any "seconds" of interest. Their knives are excellent but expensive. Occasionally they have seconds with minor, inconsequential flaws that they sell a half-price. No luck this visit - nothing of interest. On the way to Pictou we found some of route 6 (the Sunrise Trail) between River John and Pictou especially annoying. They had been replacing culverts under the road and just filled with gravel for the present so there were many "bumps". On the return path we took the less scenic, shorter and decidedly less bumpy River John Road. We made our way back to the Jost Vineyards where we tasted a few and bought a couple of old standards. From there we continued on to https://www.wallacebythesea.ca/ Wallace By The Sea where we paid a visit to https://www.homehardware.ca/store/30275 Charman's Home Hardware Building Centre to check for a clear RV water supply hose. We had see a couple around and one of the folks thought they got it from a Home Hardware in NB. They checked all their catalogues but did not seem to have anything like it - just the old, stiff and annoying white hoses. After that we tanked up and worked our way on through Pugwash to http://chaseslobsterltd.ca/ Chase's Lobster Limited in Port Howe. They still have a nice selection but we were adequatly stocked. Finally it was back to Lock Lomond RV Park Ltd. where we had steak with mushrooms and onions for dinner then spent a nice evening with "the neighbours". It's Sunday so the first order of business after breakfast was to groom "the puppy". We managed to get him suitably spiffed up and packed up to depart about 10:00 after farewells to some new friends. Today we are back on the Fundy coast only on the NS side. 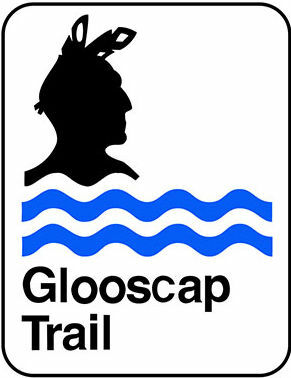 We followed the Glooscap Trail the whole way around by Joggins and Advocate Harbour. We made our way to Truro by 1:45 so we decided to grab some lunch at Murphy's Fish & Chips An excellent feed as usual. We continued on the trail until it morphed into the Evangeline Trail. After a quick stop at Just Us! Coffee & Tea House we made our way to Land of Evangeline Camping Resort where we set up camp for the night. A casual start to the day. We had some breakfast, topped the fresh water up and dumped the "ugly tanks". We finally pulled out of camp about 10:15 and made our way to Domaine de Grand Pré winery. I think Lillian likes to stop there to watch me climb up the hill from the parking to the winery. We tasted a couple of ones we did not remember a bought a couple of old favourites. We next found our way to Gaspereau Vineyards. They are related to the Jost Vineyards that we visited a couple of days back. We had never visited before but somehow we ended up with a couple of bottles of their Tidal Bay at home after last fall's trip and had quite enjoyed them which was surprising since we were not inspired by most wines of the https://winesofnovascotia.ca/tidal-bay/ Tidal Bay appelation that we had tasted. We wanter to explore this winery a bit further. Since Monday mornings are not terribly busy we had a nice chat with the lad tending the tasting room. Lillian tasted a couple of their whites then declared their Riesling to be quite good. This was a surprise since she usually finds Riesling to be too sweet and she tasted this just after tasting the L'Acadie Blanc which is quite dry and should have exaggerated any sweetness. On the red side we found the Gaspereau Lucie Kuhlmann to be very interesting. We picked up a couple of bottles "for further analysis". For the next while we wandered our way along "the trail" and said bad things about the rain. On our way to find Greenwood Military Aviation Museum we stopped at Greenwood Mall to raid the food court. After grabbing a bite Lillian went to check out the shops while I did some planning for the night. Just as I was finishing up she dragged me down the mall for mysterious reasons. It turns out that she found a shoe store that had just put their basic Birkenstocks on sale and they actually had my weird size. I ended up with a new pair. We then went on to the museum. As we arrived the rain took a break so we took Weston for a tour of their excellent outdoor exhibit. We then took time to tour the inside collection which was really excellent. I especially liked the engine "cutaways" that were really well done. Back on the road we headed for our "Plan A" for the night which was Fundy Spray Camp Ground about 5 KM outside Digby. When we got there the office was locked with a sign giving a number to call. We called the number and got phonemail. We left a message then tried the office number with similar luck. We chatted with a couple seasonal folks. One of them suggested a little camp Digby Campground which was walking distance from the town. This was one of our "Plan B" locations so we decided to check it out. Worked just fine for us and cost less. We let Weston out for a bit and studied the problem of dinner. We decided to try The Wheelhouse Seafood & Pasta which turned out to be a good deal. We shared a seafood platter and a salad supplemented by an order of calamari. They gave the option of having the seafood deep fried or sautéed so we chose the latter. The calamari and clams were still fried but the batter was excellent and light. A lovely meal the left is well stuffed. Back at camp we chatted with a neighbour who was wandering from BC until we were again rained out. At least the weather looks better tomorrow and Wednesday. 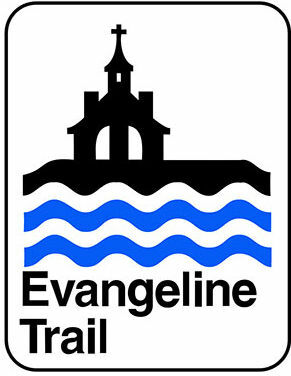 Today we set off about 9:45 and picked up the Evangeline Trail again. We were barely out of Digby when the Roadtrek asked us to check tire pressure. Nothing looked especially soft on the morning walk-around so we decided to check next time we stopped. We moved along steadily until we came to Rendez-vous de la Baie Visitor Centre on the campus of Université Sainte-Anne in Church Point, Nova Scotia. Lillian went to check the gift shop while I checked the tires. All were spot on except the right rear which was down 4-5 lbs. I dug out the compressor and topped it up since most garage pumps can't hit 80 lbs. I then popped in to the visitor center to wash my hands and check for local travel info. Back on the road, we moved along to Mavillette where we turned off to Cape St. Marys to check out the Cape St. Marys Lighthouse. We took a walk and a bunch of pictures before getting back on "the trail". As we approached Yarmouth we stopped at Lake Breeze Campground & Cottages where we had stayed on a couple of previous occasions. Again we found a sign saying they were working somewhere on the property. After some attempts to find them and check out available site we decided to move on into the Town of Yarmouth. We spent some time wandering the town along with The Roadtreking Beardie before setting off about 2:30 to resolve the camping issue. A bit of research brought us to Castle Lake Campground and Cottages. We were most pleased with what we found there. It is a relatively new park which is still being developed. It is nice and modern with some really pretty sites. We picked one and settled in to relax for a bit. At about 4:30 we dropped the shoreline and headed to http://www.capeforchulight.com/ Cape Forchu Lightstation Museum. The museum was closed as expected but we took another nice walk and a bunch more pictures. From there we made our way to Rudder's Seafood Restaurant & Brew Pub where we had a fine dinner as usual. After dinner we took Weston for a walk along the waterfront before heading back to camp. 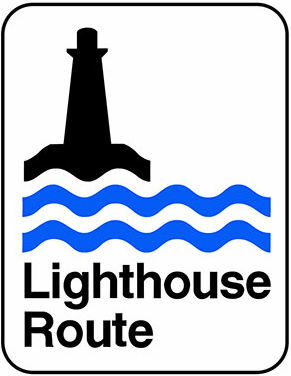 We set out on route 3 "The Lighthouse Route" at about 10:15. 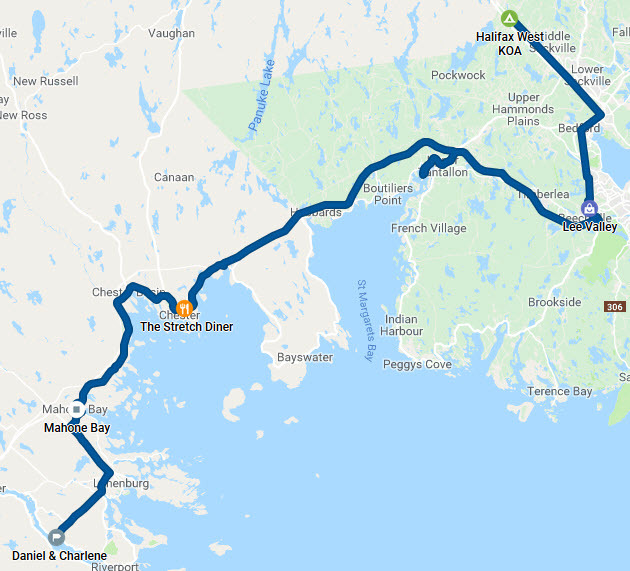 We mostly stayed on the route with the odd skip along 103 until we arrived in Shelburne about 12:30. We took a wander around the Historic Waterfront area. We were impressed by the amount of further restoration that has been done since we were here a year ago last October. We eventually ended up revisiting The Beandock for a bite of lunch. Their scallop and bacon wrap is still a special treat and their prices are very reasonable for the quality of product. After lunch we rolled a bit further on "The Route" before shifting over to the 103 to "cut some corners". We had a camp site we wanted to check out just before Liverpool that had some possibility if we wanted to attend some of the events surrounding Privateer Days this coming weekend. It turns out that the camp did not pass our taste test so we pressed on to an alternate location for the night. We ended up at RayPort Campground just past Mahone Bay which very much did suit our tastes. We are on the shores of a brook that could well be Martins River. We spent the late afternoon being entertained by an extended family of Mallard ducks and a couple of chipmunks that shared our waterfront. We eventually grilled up a fine supper of smoked pork chop, mashed potato and sautéed spinch. 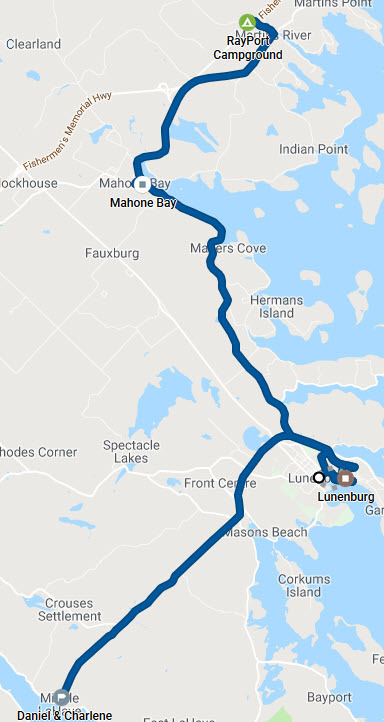 As we have been getting closer to Lunenburg County Rod has been exchanging occassional emails with his brother in the Lunenburg Area. Now that we are in the area the cell service at RayPort Campground is marginal so we used email to arrange to meet in Lunenburg around midday. We got on the road about 10:30 after dumping the "ugly tanks". We first made out way along The Lighthouse Route to Mahone Bay where Lillian had a visit with the folks at Have a Yarn. We eventually made our way on to Lunenburg where we found a place to park and headed off to wander the town. An early stop was The Mariner's Daughter, another fine wool shop. Around this time Rod's brother showed up with a friend of his partner. We chatted and wandered for a bit then it was decided that we would meet later at D&C's plac in Middle LaHave. Rod picked up Weston and we all wandered around the town dropping in at various shops. Finally we took a nice walk along the water front. We then climbed back up to Montague street where Rod left Lillian at The Half Shell patio oyster bar to order a glass of wine while Rod returned Weston to the Roadtrek. We then both enjoyed sharing a snow crab cluster and a bunch of "peel & eat" shrimps on a lovely afternoon in a beautiful spot. Just before leaving Rod snapped a couple of pictures of the Bluenose II which was in harbour just below us. We eventually wandered our way back to the Roadtrek and found our way to D&C's place in Middle LaHave. Once there Rod connected up the Roadtrek and flushed the fresh water tank and refilled it with nice well water. During this we took time to chat with D&C and generally catch up on family news. D&C then went off to a dinner for some fund raising event while we had a light meal from the galley. We eventually rejoined for a nightcap before retiring. 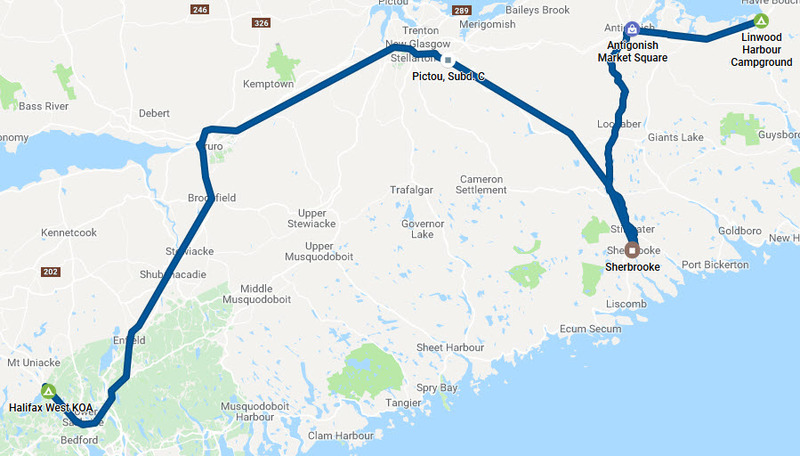 Tomorrow we hope to head up to the Sherbrooke area and possibly explore some of the Eastern Shore. We decided to position ourselves by spending the night at Halifax West KOA in Upper Sackville. 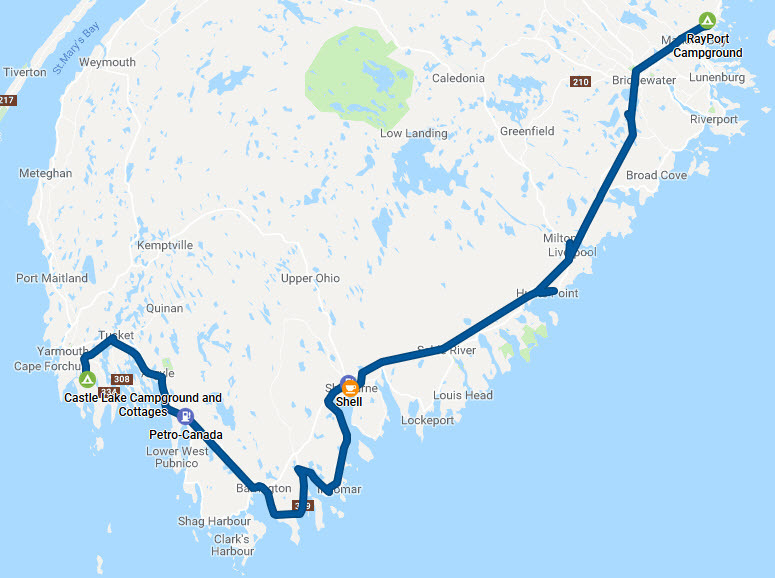 To that end we set off from D&C's about 9:40 and headed back to Mahone Bay since Lillian had some "unfinished business". After then we resumed The Lighthouse Route to Chester where we stopped at The Stretch Diner where we had an excellent and very reasonable breakfast. After breakfast we moved on to the Lee Valley Tools Halifax store to check on a couple of items of interest that we had seen in a recent catalogue. Finally we headed off to Halifax West KOA where we checked in. We could not get our favourite #10 but we got #16 which was almost as good. We decided to just spend the rest of the afternoon relaxing. We made a nice pasta sauce from the Italian sausages we bought over on the Fundy coast and left it to simmer while Rod took Weston for a tour of the camp as is our habit. We started a camp fire and cooked some pasta for a fine dinner and a relaxing evening around the fire. Today we decided to resume our tour of the Eastern Shore that we began last October by finally visiting the Sherbrooke Village Museum which was closed last attempt. We then planed to head out the Canso Peninsula. We took a pretty direct path to the village, in spite of some roads badly in need of repair, arriving at about 1 PM. We paused at the bank to pick up some $$ then set about touring the village. A lot has been done since we last visited with Rod's mother some 25-30 years ago. About half way through our tour we popped out of the village to check out our planned lunch stop Beanie's Bistro only to find out it is not open on weekends. We carried on our visit. Once through the village we looked a the weather forecast and decided the folks running StanFest had good reason for moving it to late July after 21 years of rain and cold. 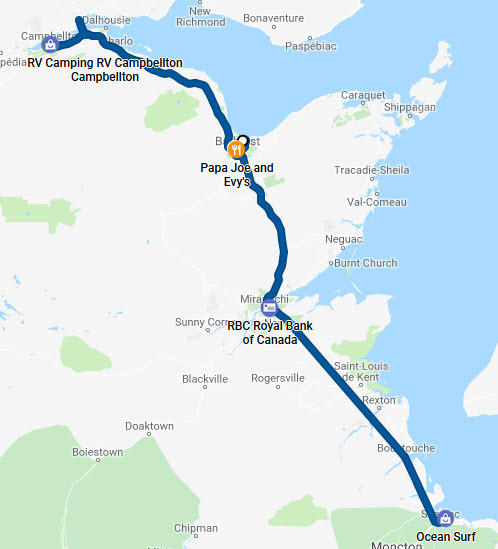 We took a look for somewhere to camp for the night and noticed than Linwood Harbour Campground where we have stayed a number of time was not far from us so we made a quick call to confirm space and pointed that way. 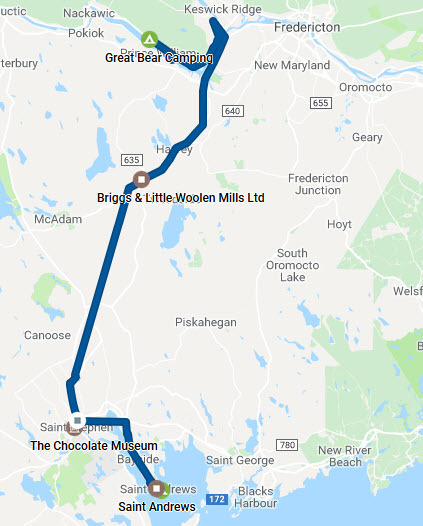 We picked a route that took us through Antigonish where we stopped at Antigonish Market Square to visit the Sobeys and NSLC to replenish supplies. We arrived at camp about 5:15 PM. We treated ourselves to a grilled rib steak with sautéed onions and mushrooms, leftover mashed spuds and a salad. As the day closes our thoughts are to start drifting homeward in the morning. 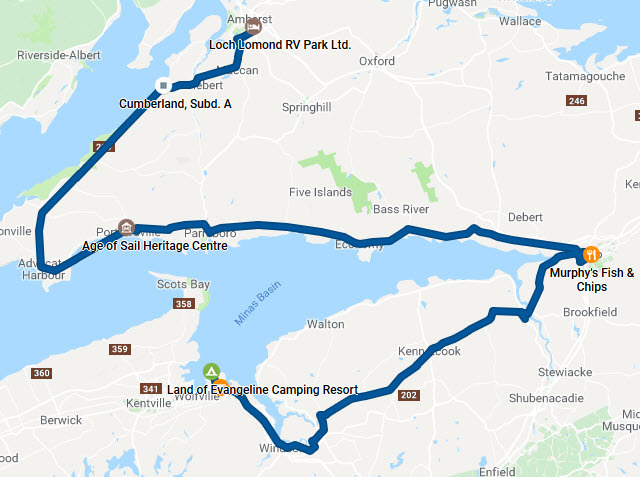 We plan to start by heading through Pictou County which is easy from here and we want to revisit a spot or 2 along "The Sunrise". We woke to a wet morning - it had rained overnight and was still drizzling. After a shower and some breakfast we hit the road about 10:00. We worked our way down to Pictou on the TransCanada the followed the River John Road and NS 6 to Tatamagouch where we tanked up. We then beat a path to Jost Vineyards where we replaced some consumed product then enjoyed a really excellent lunch at their Seagrape Café & Deli. Their portions were just nice, the food super and the preparation and presentation outstanding. From there we basically headed along the coast to Shediac, NB where we settled again at Ocean Surf RV Park-Camping. Since the rain had stopped, Rod gave Weston his Sunday grooming that he would have had in the morning had it not been too soggy. It rained most of the night so we awoke to a pretty soggy camp site. We had breakfast and Lillian took time for a quick shower and we still managed to be on the road by 9:40. We followed NB 11 on to Miramichi where we made a quick stop at the Atlantic Superstore to pick up some minor supplies. From there we picked up NB 8 to "cut the corner" over to Bathurst since we out towards Shippagan on our way into NB. In Bathurst we stopped at Papa Joe and Evy's for a nice light lunch. Food was very good and the price great. It had been raining most of the day - nothing very heavy but certainly dreary. 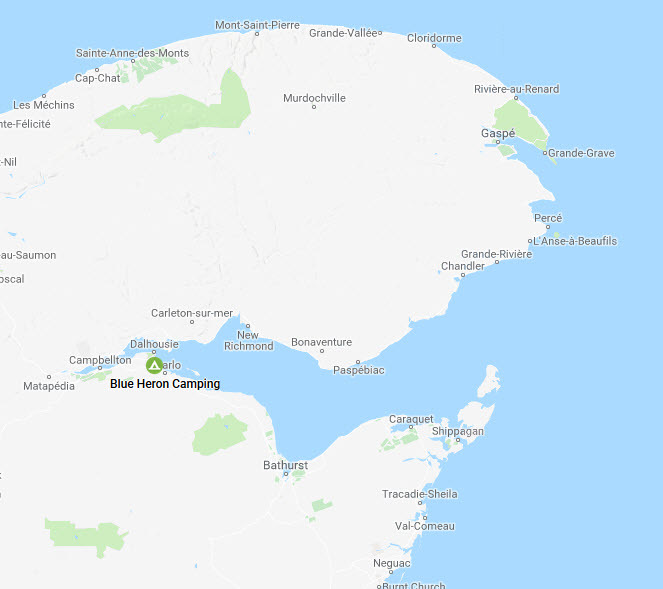 We originally planned to stay at Camping Heron Bleu near Charlo, NB, where we spent a couple of days earlier in the trip but we decided to move on to Experience Restigouche RV Camping in Campbellton just by the bridge to Quebec. It may not be a nice as "The Heron" but it is high and dry and the view is nice. For supper we wandered over to Brasserie 1026 Bar & Grill which was a short walk away. 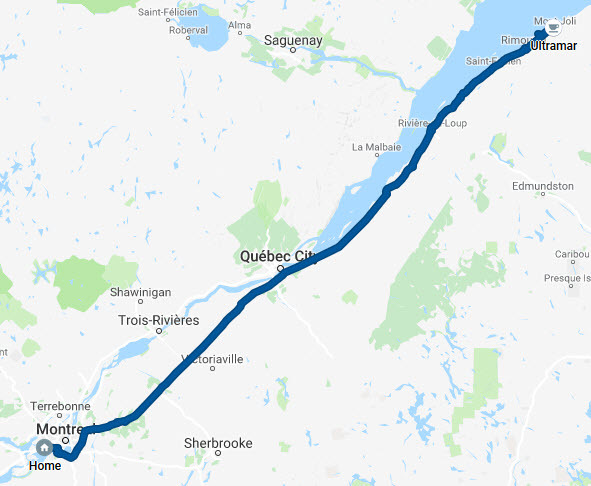 Tomorrow we cross back into Quebec and head off on QC 132 which could bring us almost home if we followed it the whole way. Today went largely as planned. 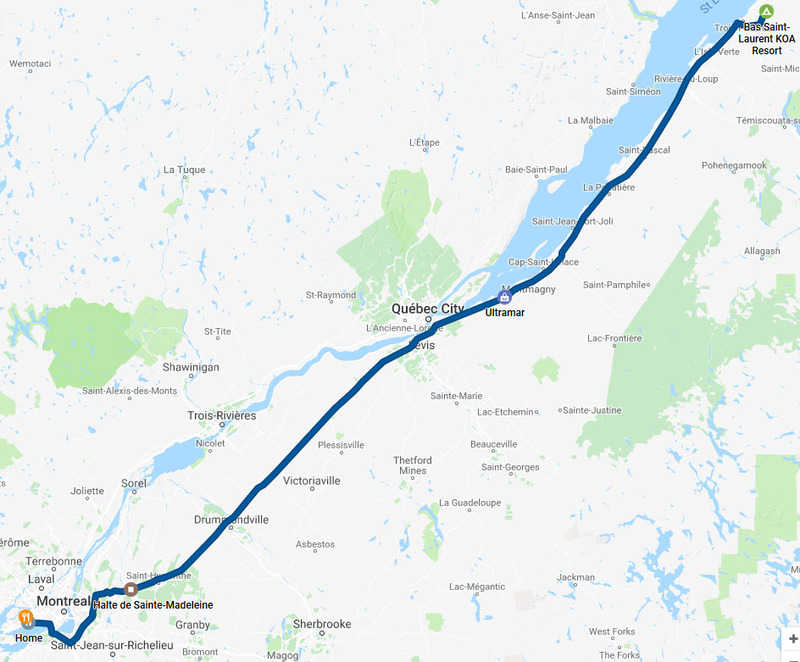 We left Campbellton around 9:00 ADT and made our way to Matane by about 10:20 EDT. We made a shopping stop at Poissonnerie Matanaise. After that we checked out Café du Monde where we split a light lunch special. After that we headed off to Ste-Luce where some friends who have one of our beardie puppies live and we spent a truly delightful afternoon and evening before crashing in their driveway. It was a very special visit. Since we were heading for home we decided to get an early start so we could make our way to the West Island before rush hour. We quietly packed up and pulled out onto the 132 at 6:00 AM and pointed west. It was generally a simple and pleasant drive home with the odd comfort, food and fuel stops. The only complication was crossing the Mercier bridge onto Montreal Island. Several lanes were closed so it took about 20 minutes extra. We subsequently discovered that this was the first day of closing and had we been only a bit later the delay would have been hours. Whew! We arrived home about 1:20 PM.